Our two pH sensing constructs consist of promoters activated through high or low pH and two fluorescence proteins with fast maturation time. When pH of the media is changed above 8.0 or below 5.0 expression of a fluorescence protein is activated. Fig. 1: Overview of the regultion of the asr promoter by RstA/B and PhoB/R system. The asr promoter was first described by Suziedeliene et al. in 19991. They showed that asr is induced through low pH, about 4.8, and that the promoter is controlled by the phoBR system. They also named the asr promoter, because of RNA they found after shifting E. coli to low pH conditions and therefore named the RNA they found and its corresponding promoter acid shock RNA (asr). In 2007 Ogasawara et al2. found a second regulatory system controlling asr transcription by SELEX search for PhoQP-RstBA binding sequences. 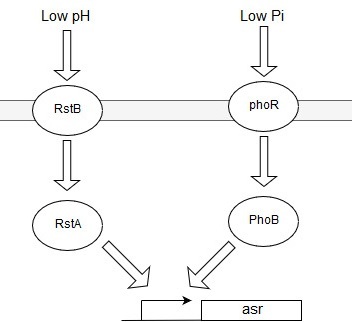 Hence the asr promoter is directly controlled by two different systems, the PhoBR system activated through low inorganic phosphate and the RstAB system sensing the pH. RstAB itself is controlled by PhoQP-system activated by low Mg2+ concentrations. This complex regulatory mechanism for this small promoter amazed us and provided us with an interesting challenge to get expression going. Because of the two regulatory systems only becoming active when Mg2+ or Pi are low expression could not be done in LB-media. Also, our M9 media used for expression for the thermos project did not work because as it seems both systems must be active to activated asr transcription and M9 still contains Mg2+. To solve this problem, we used the LPM media described by Suziedeliene et al.3. This allowed us to express our fluorescence protein mCardinal by shifting the cells to acid LPM media with pH 5.0 and 4.5. Best expression was achieved at pH 5.0. Fig. 2: Schematic structure of our asr_mCardinal construct containing all important coding and noncoding parts. This part actually is a composite part containing the asr promoter and mCardinal. Additionally, between promoter and cardinal an additional RBS, a TEV-site and a F-degron are inserted. Also, mCardinal is 6xHis-taged and the part ends with a T7-terminator. Because the part does not work when build as Biobrick due to the Biobrick scar this part is listed as basic part. TEV-site and F-degron allow a fast and controllable degradation of proteins and in combination with the fast maturation times of our fluorescence proteins, allow a fast colour change. This enables shorter time spans between signals when controlling the robot’s movement. Due to a change of our reactor design this feature is no longer needed because the pH is only changed in a small amount of media which is discarded after measurement. The 6xHis-tag allows detection of mNeonGreen on protein level and the T7-terminator stops translation. The part itself was created using extension-PCR and overlap-PCR. Alx was first described in 1990 by Bingham et al4. They created over 93.00 operon fusion with lacZ and screened those for increased activity at pH 8.5. The locus they found was named alx. In 2009 the function of alx was characterised by Nechooshtan et al5. They showed that the 5’ part of alx mRNA regulates translation by forming secondary structures. High pH leads to pausing in transcription of this mRNA part which leads to a different secondary structure allowing the ribosom to bind the RBS. Under neutral conditions the transcription is not stopped and secondary structures disable the ribosom to bind the RBS. This mechanism makes alx the first discovered pH-responsive riboregulatory gene. We used this regulatory unit to express mNeonGreen under alkaline conditions. To increase expression an extra RBS was added after the riboswitch, leading to a constitutive expression of mNeonGreen. Hence, we used our constructed without the extra RBS to get pH depended expression but also showed that the riboswitch really is the regulatory part of this system. Fig. 3: Schematic structure of our alx-mNeonGreen construct containing all important coding and noncoding parts. This part actually is a composite part containing the alx promoter and riboswitch and mNeonGreen. Additionally, between riboswitch and mNeonGreen a TEV-site and a F-degron are inserted. Also, mNeonGreen is FLAG-taged and the part ends with a T7-terminator. Because the part does not work when build as Biobrick due to the Biobrick scar this part is listed as basic part. The function of TEV-site and F-degron is explained above. The FLAG-tag allows detection of mNeonGreen on protein level and the T7-terminator stops translation. The part itself was created using extension PCR and overlap PCR. 1. Suziedeliené, E., Suziedélis, K., Garbenciūté, V. & Normark, S. The acid-inducible asr gene in Escherichia coli. Transcriptional control by the phoBR operon. Journal of bacteriology 181, 2084–2093 (1999). 2. Ogasawara, H. et al. Genomic SELEX search for target promoters under the control of the PhoQP-RstBA signal relay cascade. Journal of bacteriology 189, 4791–4799 (2007). 3. Seputiene, V. et al. Molecular characterization of the acid-inducible asr gene of Escherichia coli and its role in acid stress response. Journal of bacteriology 185, 2475–2484 (2003). 4. Bingham, R. J., Hall, K. S. & Slonczewski, J. L. Alkaline induction of a novel gene locus, alx, in Escherichia coli. Journal of bacteriology 172, 2184–2186 (1990). 5. Nechooshtan, G., Elgrably-Weiss, M., Sheaffer, A., Westhof, E. & Altuvia, S. A pH-responsive riboregulator. Genes & development 23, 2650–2662 (2009).